Whether you’re into classic rock, modern rock, or heavy instrumental rock, Drum Werks IX delivers live rock drum loops like few drum sample libraries can. Nearly 500 riff-hungry grooves ready for download. It’s time to use the right rock grooves if you’re after truly live drum tracks in any DAW or sampler. Get Ready for Some Big Rock Drums! Great rock music needs great drums. 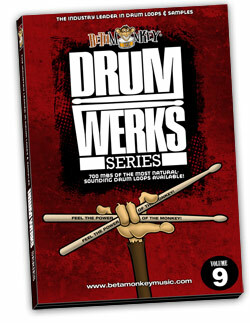 Drum Werks IX is loaded with the rock drum loops and samples you’re after. With the big, powerful rock drum sound you’d expect, this hard-rocking addition to the Drum Werks Series, you get nearly 600 rock drum loops in comprehensive Groove Sets™ from 60 to 90 BPM and a complete set of multi-velocity drum samples. Plain and simple, your music needs powerful rock drum loops. If you’re a guitarist in need of a great drummer, load any one of the hundreds of rock loops in your DAW and you’ll find groove inspiration to get your next songwriting project off and running. Available as WAVs, Apple Loops, and REX2 files, it’s time to create great rock drum tracks quickly and easily with Drum Werks IX. Whether you’re into classic rock, modern rock, or heavy instrumental rock, few drum sample libraries can match the rock drum loops on Drum Werks IX, from basic AC/DC 2 and 4’s to more complex rock feels. Drum Werks IX is for all rock musicians looking to write powerful rock tracks that will groove hard with these riff-hungry grooves, groove variations, and fills. Full Range of Hard Rock and Rock Drum Loops: Comprehensive Groove Folders: 100, 110, 140, and 200 BPM Groove Sets™. Straight-ahead grooves, cross-stick patterns, tom grooves and abundant fill choices throughout each groove folder. Cohesive Drum Sounds: You get a powerfully present snare, deep kick, and naturally resonant toms. Essentially, the sound here is how you would expect your rock drum sounds to be: powerful, present, and punchy. 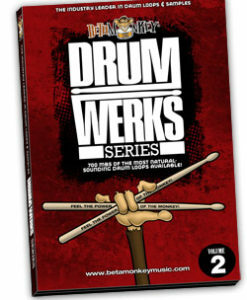 Drum Werks IX features a cohesive sound set. You get loops and samples recorded in a single recording session. 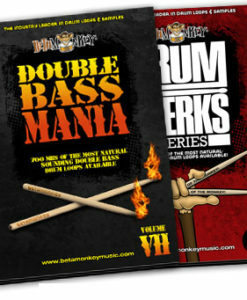 Ideal for changing tempos and feels – all drums from Drum Werks IX will mix together perfectly. Fully-Sampled Drum and Cymbal Samples: Enhance your drum tracks with multi-velocity samples of all the drums and cymbals from the Drum Werks IX sessions. Yamaha Recording Custom drums and a maple Craviotto snare, as well as Zildjian ride, hihats, and crash cymbals were recorded and sampled for these sessions. More than Just Drum Loops: In addition to hundreds of powerful rock drum loops, the disc features intro figures, buzz rolls, endings, cymbal swells and chokes and more. All the finishing touches and “little” things vital to realistic rock drum tracks. High-End Production: Recorded in a world-class recording studio. Great natural ambience and warmth – no drum replacement necessary when you have great drums and a great room. Compatible with other Beta Monkey libraries: Read more about the Rocking Nashville Recording Sessions to learn more. Drum Werks IX is an ideal complement to Drum Werks XI: Same session, same great sound, but with a focus on the mid and upper tempos. 488 original, license-free 24/44 drum loops. 16-bit version has same number of loops, but smaller total file size. 16-bit, 24-bit ACIDized WAV, APPLE LOOPS/AIFF, and REX2 loops. 92 multi-velocity drum and cymbal samples. ALL ACIDized WAV, APPLE, and REX2 formats included with purchase.